Almonds are widely recognized as a healthy source of protein, and you'll often hear them referred to as a super-food. While they are fairly high in fat, the fat they have is monounsaturated, which is the "good" kind. Portion control is important with almonds, as is true with other foods. Almonds are filling because they have a high concentration of protein and they have fewer carbohydrates per ounce than other nuts. There are a number of additional nutritional and health benefits associated with this healthy food choice. Researchers are finding that, because of their high levels of nutrients, almonds may play an important part in preventing serious diseases. According to the Mayo Clinic, including almonds and other nuts in an overall healthy diet can contribute to heart heath in several ways. Nut consumption can contribute to a reduction of LDL, also known as "bad" cholesterol. Eating nuts can also help reduce the risk of developing the type of blood clots that can lead to fatal heart attacks. While almonds are not a low calorie food, they can contribute to weight loss when included in a healthy eating plan. Because almonds are high in fat and fiber, they are filling and have minimal blood sugar impact. That is why almonds are on Shape magazine's list of Top 25 Natural Appetite Suppressants. Snacking on almonds can be a great way to get full quickly and stay that way for a period of time, allowing dieters to lose weight by consuming fewer calories overall. According to the California Almond Board, almonds are one of the most nutrient-rich foods on earth. The nutrients in almonds are natural and easy for the body to absorb. Plus, almonds are an easy snack, so it is not difficult to get the nutrients you need regularly. A serving of almonds is approximately 23 nuts and has traditionally been believed to contain about 160 calories. A summer 2012 study published in the American Journal of Clinical Nutrition, however, indicates that almonds may actually have 20 percent fewer calories, coming in at 129 calories per serving. For those that follow a raw food diet, almonds are an important source of nutrients that may not be available otherwise. Almonds are one of the only foods not derived from animals that contain a large amount of calcium. For vegans, those who choose not to eat dairy or eggs, almonds can play a large part in providing the daily allowance of this nutrient. They contain higher levels of calcium than any other nut. Calcium is important in keeping bones and teeth strong, as well as managing pain. Almonds are cited as one of the five best natural sources of calcium in an article on YogaU. One of the health benefits of almonds is the high amount of useable vitamin E that they contain: almost 70 percent of the recommended daily allowance in one serving. This makes almonds one of the best, if not the best, whole foods source of this vitamin, according to NutsForAlmonds.com. Vitamin E is important for healthy skin, a healthy circulatory system, and tissue repair in the body. These tasty nuts contain about 12 percent of the daily amount of protein required by an adult. They make an excellent mid-morning or mid-afternoon snack, giving a boost of long term energy rather than a quick sugar high followed by a crash. 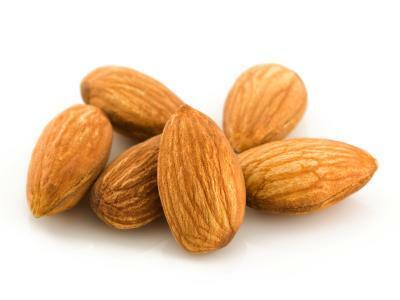 A few almonds every couple of hours will help keep the blood sugar stable, a benefit for those with blood sugar issues. FitDay.com lists almonds as one of the ten best vegetarian protein sources. The health benefits of almonds are many. To get as much benefit as possible, consider buying organic almonds. By making almonds a regular ingredient in your cooking and baking and using them as a snack, you can increase your intake of all of the nutrients that almonds have to offer. While it is not unusual for people to think that drinking almond milk brings about the same health results as eating almonds, that is not the case. Almond milk is not bad for you - it can actually be very healthy as an alternative to dairy milk. It is simply not the same as eating whole almonds because it, in fact, does not contain whole almonds. Almond milk is made from whole almonds, but has very high water content. The entire nut does not stay in the beverage, so some of the nutritional value is lost. Sweetened versions of commercial almond milk have significant sugar content; according to Joy Bauer they are more like a dessert than a beverage. If you'd like a version of almond milk that is very close to the nutritional properties of whole almonds, you can make your own. Visit WHFoods.org for a recipe that involves soaking almonds overnight and combining them with pitted dates, water, and salt in a blender, then straining the resulting mixture through cheesecloth. Some of the nutrients from the almonds will still be removed, because the remaining chunky parts of the nuts are strained out. Eating almonds can be part of just about any healthy eating plan. Unless you have an allergy to nuts, chances are that you will benefit health-wise from consuming reasonable portions on a daily basis as part of a balanced diet. Just be sure that you aren't eating so many that the calories put you off-track from reaching your weight loss or weight management goals.